RBTH explores why you should watch Russia’s biggest racing event from October 8-11. When a Formula 1 race debuted in Russia in 2014 with its own circuit in Sochi, many people were blown away. The modern track could hold 55,000 spectators, it featured a spacious pit stop and had a state-of-the-art media center – the premiere of this new Russian sports project was a triumph in itself. 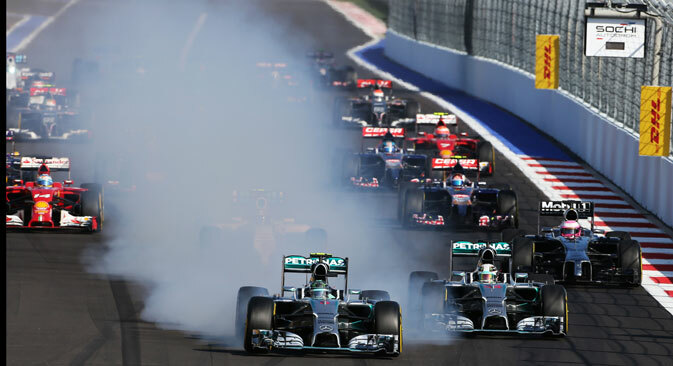 Even though it will be difficult to amaze fans in 2015, there will still be much to see at this year's edition of Russia’s Formula 1 race. The Sochi Autodrom is the only Formula 1 track in the world located directly inside an Olympic park. Although the race’s drivers won’t have much time during the race to admire the modern sports facilities used during the recent Winter Games here, the fans high up in the stands will take in some marvelous views. Besides the sleek buildings that make up Sochi’s Olympic Park, fans can also catch a glimpse of the sea and the nearby Caucasus Mountains. The racing loop by the Black Sea is one of the longest in the world. Famous German racetrack engineer Hermann Tilke managed to fit 5,853 meters of roadway with 19 turns into a rather small plot of land between Olympic buildings. For an urban track, participants at Sochi’s Autodrom can move rather fast: the first curve provides opportunities for overtaking competitors, much earlier than at comparable tracks, such as at Monaco's Grand Prix. Many large sports complexes throughout the world are forced to remain idle for most of the year. Yet, the Sochi Autodrom managers took a risk and chose to build a stationary structure rather than one that can be dissembled easily, a gamble that has paid off for now. Besides junior race series such as TCR and drag racing, the track has hosted an air show with Russia's best aerobatic teams. At the end of September it will host a wheelchair race. On days when there are no events scheduled visitors can take a "race taxi." A five-kilometer ride in a Mazda MX5 Aori, a Ferrari F430 or a Lamborghini Gallardo Superleggera accompanied by a professional racecar driver costs 2,000 rubles ($30), while a 20-minute session in your own car costs twice as much. The Sochi Car Museum featuring a collection of Soviet retro cars can also be found on the premises. While in 2014, the victory in Sochi went to Mercedes AMG drivers Lewis Hamilton and Nico Rosberg as had been expected, in 2015 the German team's supremacy over its competitors is not assured. Drivers such as Sebastian Vettel and Kimi Raikkonen from Scuderia Ferrari will be battling for the top prize. Felipe Massa and Valtteri Bottas from Williams are also not taking the competition lightly. And of course, Daniil Kvyat from Red Bull Racing will want to shine in front of the home crowd. A captivating race weekend awaits the public.